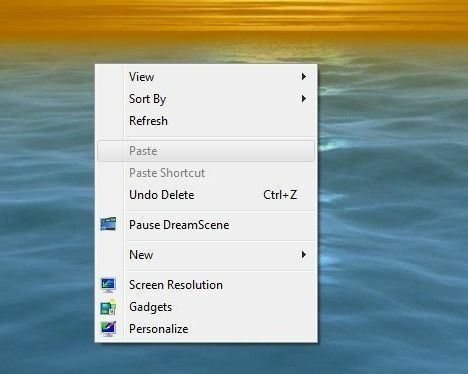 Windows DreamScene, a feature which allows a video clip, movie show, slideshow or animated image and picture to be set as the desktop background in Windows Vista has been removed in Windows 7, in favor of Desktop Slideshow wallpaper auto rotator. 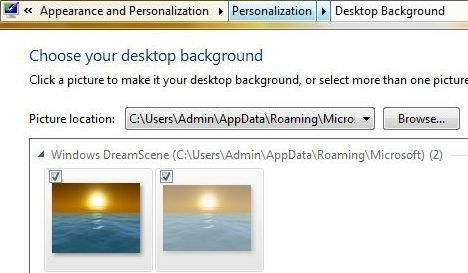 Although Windows 7 no longer supports DreamScane, the DreamScene function can still be manually added and installed into Windows 7 with a little hack in order to turn on and enable the DreamScene support in Windows7. In order to enable DreamScene in Windows 7, the similar hack which allows DreamScene to be installed on non-Ultimate edition of Windows Vista such as Windows Vista Home Basic, Home Premium, Business and Enterprise edition is used. The DreamScene installation hack has been compiled into an executable, which automatically copy the necessary DreamScene files and merge require registry keys and entries. For 32-bit Windows DreamScene: Run the Windows7-DreamScene.exe as Administrator to install and enable Windows DreamScene on Windows 7. The installer will copy DreamScene.dll to %WinDir%\System32 folder, DreamScene.dll.mui to %WinDir%\System32\en-US folder and add the required registry keys and values. Then it will automatically restart the Explorer to make the installation of DreamScene works immediately. For 64-bit Windows DreamScene: Unpack the DreamScene_Win7_x64.zip archive, then copy DreamScene.dll to %WinDir%\System32\, DreamScene.dll.mui to %WinDir%\System32\en-US\. Run Dscene.reg to install the required registry keys and values. Restart Explorer or reboot to complete the installation. A Windows DreamScene folder has also been created in %WinDir%\Web\ folder. You can place any video file that you want to set as DreamScene background wallpaper here as in Windows Vista, or anywhere you like. However, the folder is less useful as Windows 7 does not support direct viewing of video or animated media in Personalization Control Panel. To apply a video clip (in .WMV or .MPG format) as the DreamScene animated wallpaper desktop background, right click on the video media file, and select Set as Desktop Background in the context menu. Due to DreamScene been stripped from Windows 7 issue, video files may not be visible inside Personalization and Desktop Background configuration page. However, all features of DreamScene, such as Play DreamScene, Pause DreamScene and sound/audio are supported. Some users may experience black or transparent desktop icons’ text after enabling DreamScene. Here’s how to fix the issue of desktop icons’ text gone missing or transparent after setting up DreamScene video.